Isabel Downe was born and raised on an idyllic farm nestled in rolling pastures, woods, and a spectacular view of the distant mountains. It was here that her life took a turn from the ideal to one of difficulty. 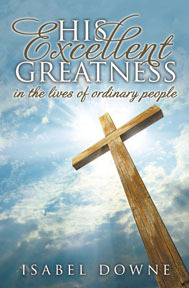 This story reveals how she overcame formidable challenges to experience a life filled with blessings and international travel, all the while seeing and learning about "His excellent greatness in the lives of ordinary people." Hers and others' stories are told in this inspiring, uplifting, and true account of how the Lord is ever present as we forge ahead on this journey called life.